The Tortola ferry is the best low-price option. 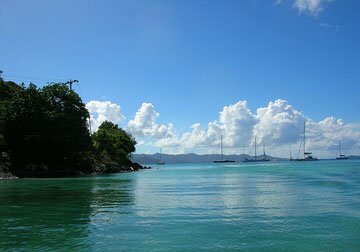 Taking the Tortola ferry from St. Thomas is the best way to save some extra cash. 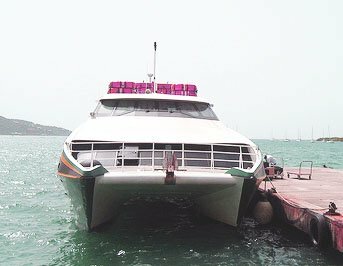 By taking the ferry you will save at least $300 per person round-trip. With several ferries running between St. Thomas and Tortola you'll be hard-pressed to miss the boat. With all that cash you're gonna save you could rent a small yacht for a day, or upgrade your accommodations. The downside is that it will cost you about an hour to Tortola and an hour back. I consider this a small price to pay for that kind of savings. In addition to the financial savings, you can skip the hassle of the Tortola Airport, or any possibility of losing your bags. Part of the fun of taking the Tortola ferry is the breathtaking scenery. First you'll get a spectacular view of St. Thomas' Southern shoreline. Soon after the ferry will make it's way alongside St. John. When you see Whistling Cay on your right side, you know your almost there. With four different ferries servicing Tortola from St. Thomas you won't find it difficult to hitch a ride. However, if you arrive after dusk you'll end up having to stay the night in St. Thomas. I've put together the Tortola ferry schedule to help you coordinate your trip. Always check with the ferry companies, because they often alter their times and days. They even alternate routes with each other from time to time. Please note that any route with an asterisk (*) means that those times alternate depending on the week. My suggestion would be to only buy a one-way ticket. I say this because then you aren't stuck with having to catch the exact same ferry back to St. Thomas if your times are conflicting. It will only set you back a few bucks,but it's well worth the price. Snorkeling and scuba fanatics that wish to bring their own gear, should consider this option. Often times Caribbean airlines will have strict cargo capacity limits on their smaller aircraft.